Following the nights of Oct. 30, 31, Nov. 1, Nov. 2 when there were no construction trucks entering into the construction sites so people’s no night time protests, there were no construction trucks entering all day on Nov. 3, Saturday. Village was unusually quiet. All the policemen and police buses that have always parked near the bridge disappeared. People’s routine works went on: 7am, 100 bows, 11am, Catholic mass, 3pm, protestant mass, 8pm, candle vigil. Sitting, watching and keeping gates amidst cold wind from 7am to 9pm. The peacekeepers who daily make efforts to serve coffee and distribute public material kept the gate from 7am to 6pm, too. Monitoring went on, too. One could see many workers leave the construction site probably for weekend’s rest. One could hear loud voices of some Vietnamese workers. 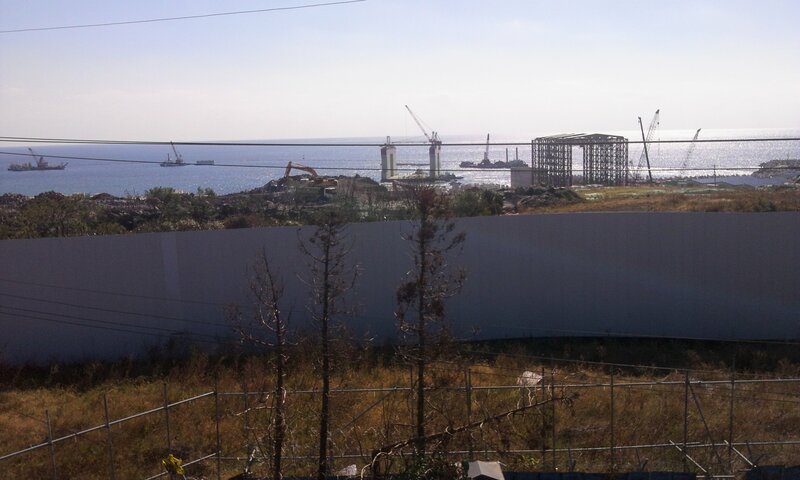 They are already working on construction inside the Gangjeong naval base construction area. About 100 Vietnamese are told to have come. The navy -contracted companies have also employed Some Sweden technicians, too. Their business are international.. hm. During the day, you could see destruction is endlessly going on beyond the white navy fence. ‘They are making a dock in the coast to carry the caisson to the floating dock on the sea.” Inside the caisson frame, workers are busily working on. The 24 hour construction will starts on Monday, Nov. 5 again as the workers have already set up the bottom plate to build caisson, people say. Sunday break is bliss. But it is a like a quiet night just before the storm again.